Media companies have been adding commerce to the list of revenue sources that can compensate for print advertising declines, Campaign's Digital Media Strategies conference heard. A panel consisting of the chief executives of Hearst, Future, Haymarket and Time Out Digital were asked what single revenue stream they would bet on for the future sustainability of their companies, and the latter three answered commerce. "We're overhauling ecommerce on our site to make sure it's true to brand. For example, we launched a restaurant gift box in December that offered 10 1-for-2 cards at top London restaurants. These sold out in 36 hours at a £50 price-point," Christine Petersen, chief executive at Time Out Digital told the panel moderator, Campaign's global head of media Gideon Spanier. "We're looking if there's more to that," she added. "Is there a subscription model? Value in curation?" Another initiative is a follow-up to the launch of a TimeOut Market in Lisbon, a food and cultural market which is attracting around 3.6 million people annually. "Unlike other food halls which are based on who signs up first, TimeOut Markets are about curation. They're about the best places to eat and this will change and evolve with time. We have announced openings in Miami, Boston, Chicago and London," Petersen said. Hearst Magazines has also been using its 23 brands, most of which are in lifestyle categories, to enter the commerce space through affiliate links in a partnership with Amazon. But the real revenue stream its president and chief executive James Wildman is betting on is turning the respect and reputation of titles like Good Housekeeping into lucrative endorsement and accreditation deals. "I'm really excited about the Good Housekeeping Institute. We test thousands of products every single year for the magazine and website and its' labs and procedures are respected. Last year, we worked with Procter and Gamble to test their Olay Night Cream. It flew through testing and got strong results. Good Housekeeping's beauty director, Eve Cameron, fronted an ad for the cream - it was an interesting way for us to work with them," Wildman said. "Haymarket is famous for its automotive business which has brands such as What Car?, PistonHeads and Autocar. We found we were becoming one of the largest car dealerships in a sense, with a thousand in-market buyers on What Car? in aggregate every 15 mins. We decided we wanted to insert ourselves at the heart of the transactional funnel," Kevin Costello, chief executive of Haymarket Media Group (the parent company of Campaign), said. So just under a year ago, Haymarket launched Haymarket Automotive, an enlarged business that operates a single digital platform, enabling car buyers and sellers to interact, access data and consume content produced by all Haymarket Automotive titles. 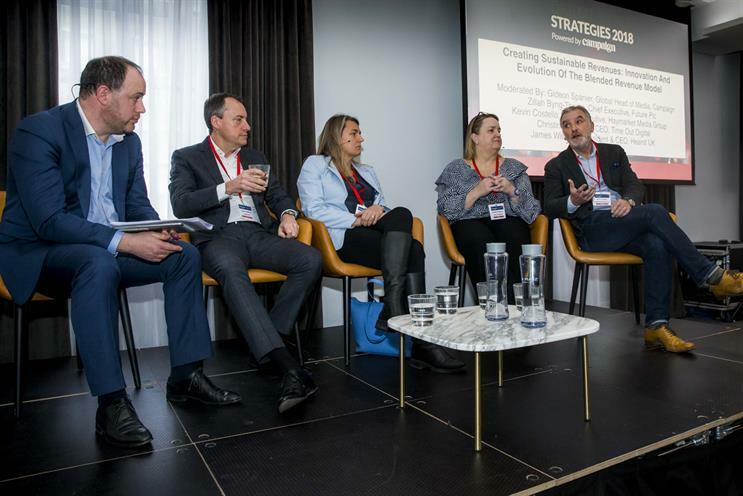 The key is to work with audiences and monetise what they value, rather than put up paywalls that may prove barriers, Zillah Byng-Thorne, chief executive of Future, explained. Using one of Future's magazines, PC Gamer as an example, Byng-Thorne shared how its audiences weren't prepared to pay to get past a paywall, but they loved the idea of a membership. "What our audiences really wanted was a membership that gave them access to gaming with groups of like-minded gamers. So we gave them a membership that let them game with our editorial team," she shared. Haymarket is starting to translate the reviews and accreditation processes of some of its brands into a revenue stream via affiliate links. "We’ve got a number of brands that have a huge amount of influence of what people buy. What Hi-Fi? is such a brand – the thoroughness of the process it uses to review products is so respected you'll see its seal in every Hi-Fi retailer," Costello said. "We want to exploit the ecommerce opportunity. Having read our reviews, audiences were then going offsite to buy. So we're trying to be part of that transaction. We're doing our best to catch up on this new income stream." It really is all about giving audiences a choice so they pay only for what they really want, Byng-Thorne said. "Some don't mind ads, some will pay to get rid of them. You need to work with audiences rather than create barriers." The theme of Digital Media Strategies, which is taking place at County Hall on 8 and 9 March, is "Creating a sustainable mixed revenue model power by digital".